How to Avoid Starring at Your Feet. The snow-capped face of Annapurna III stares down at each weary trekker that passes by her cascading rock surface; almost instinctively you try not to look her in the eye, making yourself content to simply stare down at your own two feet as they try to avoid puddles and uneven rock surfaces between each step. After what feels like an hour you look up to realize the scenery all around you has changed, not drastically, but enough to make you inquire to yourself, “When’s the last time I looked up?” In a coliseum of rock giants it seems a little mundane to be more descript about the stitching and contours of your hiking shoes rather than the sea of mountain peaks in front of you. But, when trekking, especially for the first time this is simply a way of life – the foot stare. While it may sounds like a rather simple action that can be easily reprimanded, it’s incredibly difficult to consciously break your attention and bring it back to the mountains, the forests, and the cultural life surrounding you. For my part, the Annapurna Circuit (that I completed on just before the festival of Holi) was demanding at best, and leaving at 7:30am every morning I truly did have a vast amount of time to reach the next viable destination; time to stop for tea, take some pictures, play football with local children, and just soak everything in. However, the second my boots hit the trail I had an insurmountable urge to press on in the fastest pace possible, bypass anything that wasn’t marked with the red & white trail flag, and feed the egotistical me that wanted to hear, “you came all the way from [some distant town] today! ?” When in truth, I should consciously have taken my time and stopped to feel and interact with my surroundings, given that I gave myself ample time to do so. You wait weeks, months, sometimes years to afford yourself the opportunity to trek through the vast and immense Himalayan regions, but yet something drives us to consistently focus on time and pace. Perhaps the unconscious pull of our commitments and attachments of the life we live make us feel uncomfortable taking time to ourselves – and it seems difficult to clear you mind of these. In fact the beauty of trekking is that it requires constant attention to your immediate surroundings; where to place your feet, the best spacing to maximize climbing efficiency, where the trail breaks up ahead, what the clouds are doing etc. This focus allows your mind to slowly leave the clutter of thoughts behind as you focus solely on each step, each benchmark, and your goal for the day. Sure you may find yourself on the trail with fifty other people all searching for the same reprieve, but in each person there’s an intimate agreement that the trail is somehow personal, and that personal space is always recognized amongst others. The truth is, at least for myself, I tend to be easily caught up in self-imposed goals and expectations of what I should be able to attain trekking in a day that I become almost robot-like in accomplishing those functions. The ‘foot stare’ is a way to detract myself from my immediate reality and reach these goals. 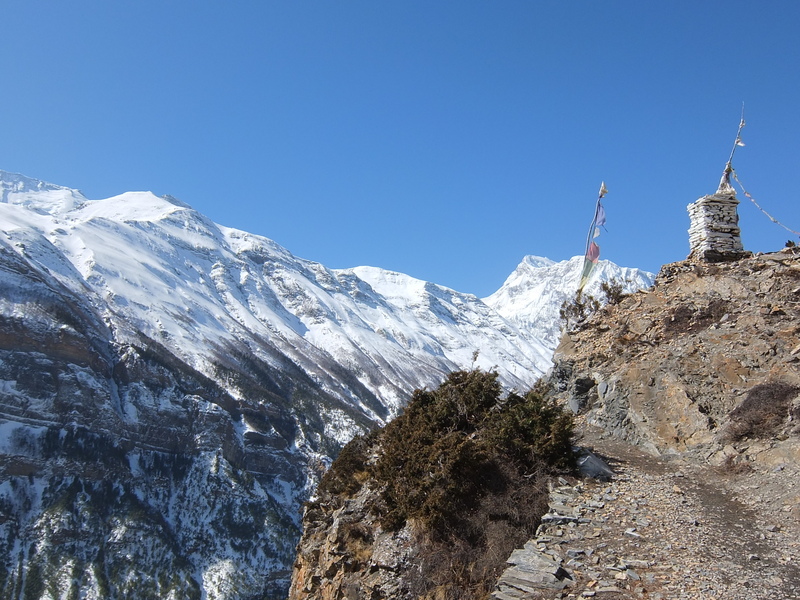 It took some time before I was able to truly begin to appreciate my trekking experience on the Annapurna circuit. Before I was able to look ahead on the trail, take in the monstrous birds that circle above, appreciate the sparse but beautiful wildlife, and truly recognize the immensity of the Himalayas. However, it seems to me that the ‘foot stare’ doesn’t simply begin and end in the Himalayas. In whatever facet of life we find ourselves we tend to ‘stare’ down at our feet as we act on routine and go through our daily lives, and surely, if we stopped for a minute to take a look around we would see a life that we may fail to fully appreciate, one that is just as beautiful as any Himalayan peak. Nice thoughts Tyler. Well said.